UA students and community members share traditions and cultures, learn about local opportunities, and meet new friends at Global Café. 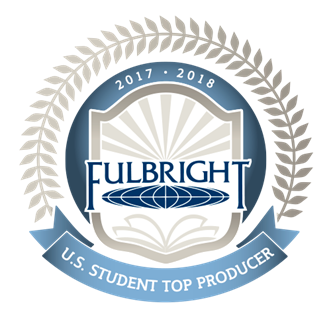 The Fulbright U.S. Student Program offers grants for independent study and research projects and for English teaching assistantships overseas. Download the 2018 winner flyer here. We have an exciting calendar of events for the spring 2018 semester. We'd love to see you there! Click here to see what's happening. Tuesday, February 26, 11:30 a.m.–1:00 p.m. | Refreshments will be provided. Everyone with an interest in international education is invited to celebrate Fulbright opportunities. Tuesday, February 12, 5–7 p.m. | Refreshments will be provided. Tuesday, March 26, 5–7 p.m. | Refreshments will be provided. A fun evening hosted by the CCBP student leadership team. Tuesday, April 9, 5–7 p.m. | Refreshments will be provided. Comments from international scholars about their experiences, recognition of tutors, photos with language partners, and a group photo with Big Al. UA Fulbright Alumni share their experiences and offer valuable advice for applicants. Tuesday, November 13, 5–7 p.m. | Refreshments will be provided. Want to learn more about the Fulbright U.S. Student Program? Students interested in applying for the Fulbright Scholarship can learn more from Capstone International Center, international.ua.edu/fulbright/, visit www.us.fulbrightonline.org, or email beverly.hawk@ua.edu. Do you have a question about Global Café? Send us a message through the form below!